We are so fortunate to have three amazing alpine destinations so close to Vancouver, with each coming alive in the winter time. The beauty of having these mountains in our own backyard is that we can easily drive up for some fun, but even if it’s not snowing on the roads, it’s important to be careful. 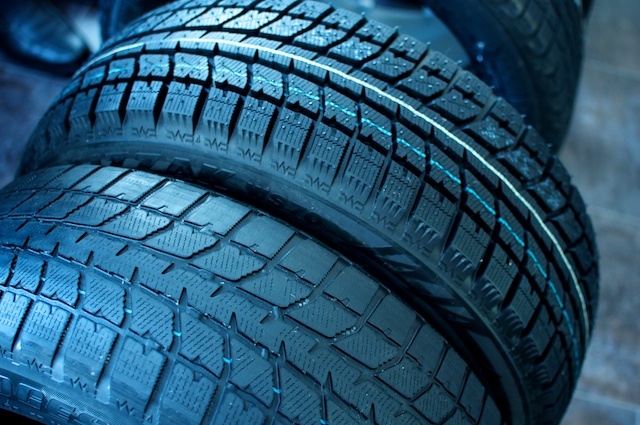 As soon as the temperature drops below 7*C, you need to change your tires and watch out for icy or unsafe road conditions. Offered by all three local mountains, the snowshoe experience is different (and equally stunning) on each. 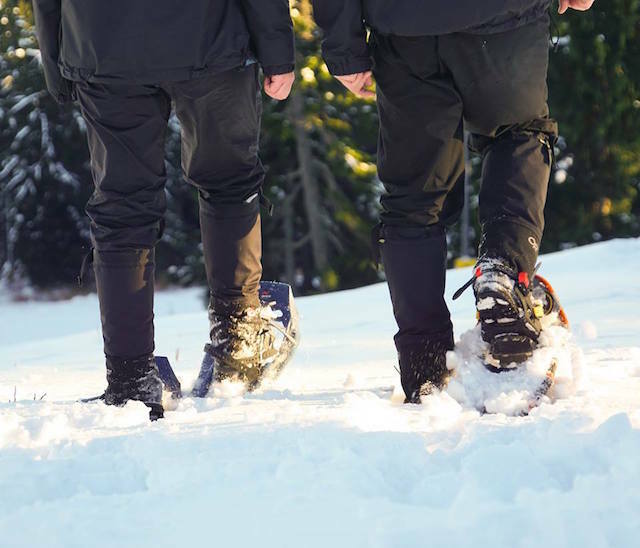 Cypress snowshoe tour options include: Hollyburn Meadows Tour, Winter Wanderer Tour, Chocolate Fondue Tour, Girls Night Out Tour, Music Night Tour, and a Cheese & Chocolate Fondue Tour. Chocolate Fondue, Valentine’s Day Chocolate Fondue, Baby & Me Guided Tour, Snowfit, Watershed Tour (Partnered With Metro Vancouver), and Private Guided Tours. Over on Grouse Mountain, snowshoe options are: The Snowshoe Grind™, Race Prep Clinic, Baby & Me Clinic, Boomers & Zoomers Clinic (50+), Ladies-Only Clinics, Beginner Snowshoe Clinics, Private Snowshoe Fondue, Private Snowshoe Tours, Snowshoe Social Nights, and the Snowshoe Grind™ Mountain Run. Vans, Transworld, K2, Comor, Rip Curl, and Rockstar are just some of the brands hosting industry events at Mt. Seymour this winter. Over at Cypress you’ll find Siggie’s Demo Day with Fischer & Salomon, Deep Cove Outdoor Demo Days, and a Healthy Family Expo. Enjoy a night of skiing or snowboarding while you support an awesome local organization during Shred for a Cause at Mt. Seymour. Head up Monday nights (between January 23 and March 27, 2017) and ladies can ski or snowboard at Mt. Seymour for $10, with $5 from every lift ticket going to The Bloom Group. Men are still welcome to come out and enjoy some evening shredding and donating to the cause. There’s NO need to pick up any vouchers at retail outlets this season. Tickets will be sold out of the ticket booths at Guest Services. The Bloom Group Community Services Society has provided some of the most progressive social services in Vancouver’s Downtown Eastside for over 50 years. We support the most vulnerable in our community through the provision of a range of housing, health and social services. Grouse Mountain’s ziplines are open year-round! The dual-line, 5-line circuit gives you an adrenaline-pumping tour across the peaks and canyons of Grouse and Dam Mountains. The tour lasts about two hours and can be booked as an individual or as a group. Select a 3-line or 5-line tour and include Skyride and mountaintop activities. Enjoy fine dining at The Observatory at Grouse Mountain. Taking you beyond casual, mountaintop fare and elevating your fine dining experience. It’s open for reservations 7 days a week and admission to Grouse Mountain is complimentary with advanced dinner reservations. 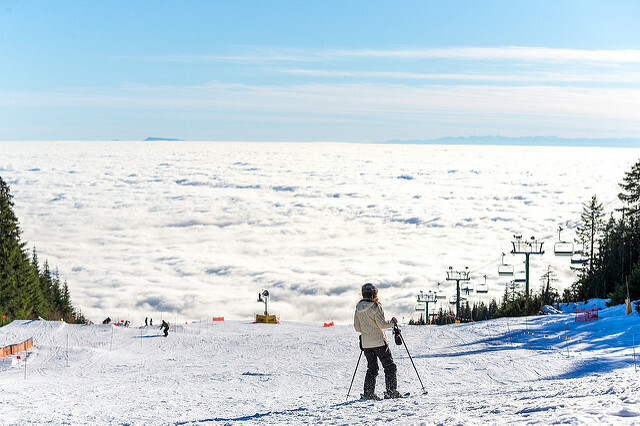 Cypress Mountain’s Hollyburn Lodge sits on the western shore of First Lake and is connected to a network of ski and hiking trails that wind through the hemlock, cedar and fir forests of Hollyburn Ridge. It is the only surviving commercial lodge built on Vancouver’s North Shore Mountains before 1960! On Saturday nights this season (starting in January), you can enjoy Hollyburn Music Nights with live music and hearty food following your day of nordic skiing. Breakfast with Santa, choirs, a gingerbread competition, a sliding zone, light walk, reindeer ranger talks, story time, crafts, and much more will be found at the Peak of Christmas on Grouse Mountain between November 25, 2016 and January 2, 2017. Watch fun family Christmas movies on the big screen in the Theatre in the Sky and skate under the stars and enjoy live music. 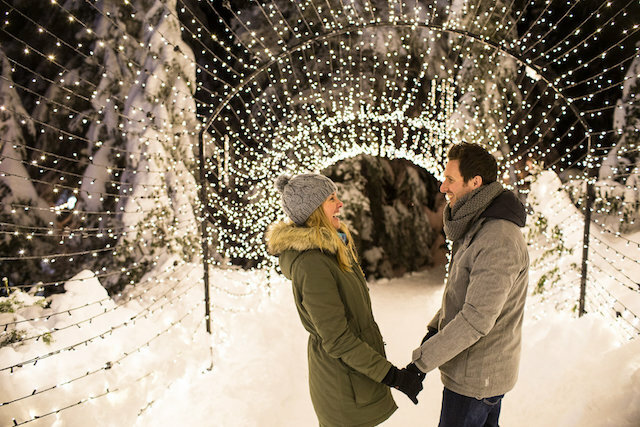 Our local mountains always host fun, family-friendly New Year’s Eve celebrations and this year you can enjoy an early countdown, live entertainment, fireworks, skating, sliding, and even a free family snowshoe tour at Grouse Mountain’s New Year’s Eve celebration. Family First Night at Mount Seymour will have tobogganing, fireworks, s’mores, and more! When the temperature drops in the city, you should prepare your vehicle for winter conditions — and the winding roads that will lead you up to these awesome winter experiences on our local mountains. In fact, each has info on their website about road conditions, including recommendations to use winter tires between October 1st and April 30th. Last year I spoke with James D’Souza, Service Manager at Westwood Honda to get his top tips for getting your vehicle ready for winter. Talk to your local tire expert for advise and tips, and check out Honda’s Lowest Price Guarantee on Tires — they’ll match the lowest price of any competitor, making it an easy decision to stop by, gear up, and hit the slopes.